These are the kind of CDs that I hate to review. Not because "Polar Shifts" is a bad CD. It isn't. 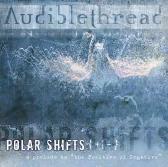 But rather because -- despite the fact that this is an obviously talented band, that the CD is professionally produced and that the six tracks here adequately entertaining -- "Polar Shifts" just never grabbed me. I can get a sense of what the band is trying to accomplish (a sort of melodic harmony backed with heavy music and sonic atmosphere) and, I guess, they're pretty successful at it. It's just that as "Polar Shifts" played, I found myself anxiously awaiting the next track, hoping that it would be more engaging than its predecessor. Even a cover of Nine Inch Nails' "Something I Can Never Have" didn't have the bite I hoped it would. It's quite possible the problem here is with me. Maybe "Polar Shifts" and I just don't click. Multiple listenings didn't help, as they often do with more challenging rock. Still, I calls 'em as I see 'em and "Polar Shifts" just isn't my cup of tea. Maybe it's yours. Visit the band's website at http://www.audiblethread.com or their MySpace.com page at http://www.myspace.com/audiblethread and decide for yourself.